Nigel Farage was forced to abandon a public appearance in Rotherham after being cornered in the town’s UKIP office as protestors surrounded the building. Police told him not to leave the office, which he was due to officially open, because a crowd of 40 demonstrators were gathered on a narrow pavement outside. The UKIP leader ended up being escorted from the office by police, who held a large red umbrella over his head for protection. Farage blamed the protest on trade unions, accusing them of funding “undemocratic and anti-British” demonstrations against his party. Local Labour MP Sarah Champion accused him of trying to capitalize on the abuse scandal ahead of the general election in May. 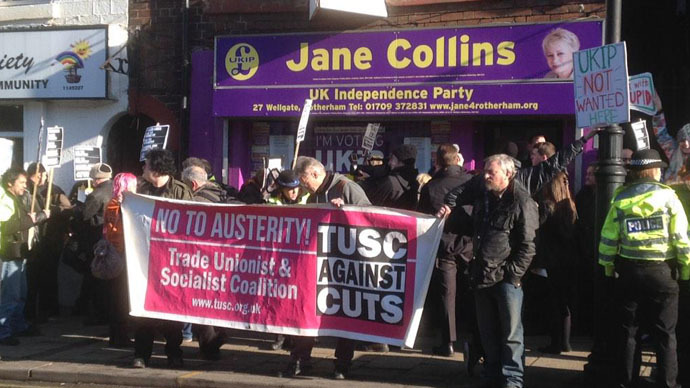 Demonstrator Alistair Tice, of the Trade Unionist & Socialist Coalition (TUSC), said the protest was organised quickly in response to Farage's visit.
.@daily_politics crew are now stuck in the UKIP shop as its surrounded by protesters at Farage coming to #Rotherham to rubberneck. Speaking to RT, he said: "There were maybe thirty protesters on the demo and it seemed like at least as many press and media people. Farage was conducting interviews inside the shop and after over two hours waiting for him to appear, he was literally smuggled out by his minders into a 4x4 which sped off." "Only later did we hear that he had cancelled a planned public appearance. Obviously not so much the 'man of the people' that he likes to make out," he added. Tice said the people of Rotherham were "fed up of far-right groups parachuting in trying to exploit [the abuse scandal] for their own racist ends." He said TUSC joined the demonstration to "protest against the 'more Tory than the Tories' party which promotes anti-immigrant feeling and division whilst wanting to carry out even more cuts in public spending." “Everywhere we go there is an attempt to stop us engaging with the public,” he added. Rotherham was the site of widespread child sexual abuse between 1997 and 2013, when gangs of predominantly British-Pakistani men abused an estimated 1,400 children. Farage’s visit follows the wholesale resignation of Rotherham Council’s cabinet earlier this week after a damning report found they had demonstrated “resolute denial” when they were told repeatedly the abuse was taking place. The report, written by Louise Casey of The National Crime Agency (NCA), found the council had a “deep-rooted” culture of cover-ups and that some staff didn’t report concerns for fear of appearing racist. Communities Secretary Eric Pickles has sent government commissioners to take over the council’s management, describing the authority as “not fit for purpose” on Wednesday. Writing in the Independent on Friday, the UKIP leader said he would call for a “wholesale change” of the council during his visit to Rotherham. “As for the crimes and the criminals themselves, I do hope – though I won't hold my breath – that the political elite that steered us blindly into this multiculturalism experiment have learned the lessons of what they think is 'tolerance' but what is actually complicity,” Farage wrote. “It’s like some kind of voyeuristic tourism,” she said.